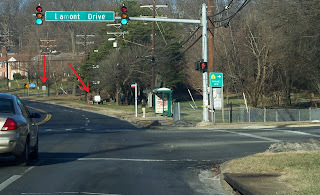 A reader has submitted some interesting photos of the New Carrollton speed cameras taken in January, 2010 on Riverdale Road near Lamont Drive. 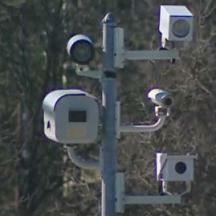 Here you can see a typical setup of a mobile OptoTraffic Speed Camera trailer. 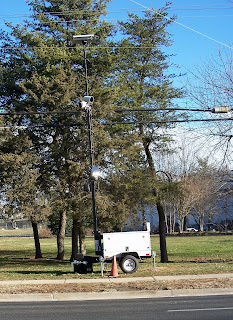 Note the multiple cameras and sensors on the telescoping pole which places the sensitive instruments right next to high voltage power lines. Click on the images for a full sized view. The next image provides a nice view of the camera device itself and the location on Riverdale Road where it is being set up. In this image you can see the ruts formed where the vehicles that deploy and maintain the device park ( in a spot which would most likely been a parking violation for ordinary drivers ). The trailer (which has serial numbers and technical specifications displayed but no license plate), was positioned just before the end of the school zone... so close that vehicles would be within 2 seconds of passing the "end school zone" sign marking the end point of the "school zone" camera's authority to issue tickets. The location of this "school zone" speed camera was in fact not marked as a school zone until very recently. On the top image you can see the recent image of the camera. Note the "End School Zone" sign. 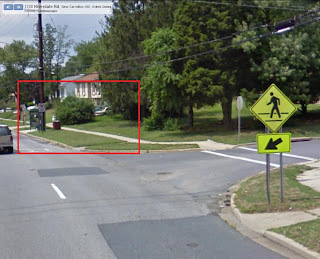 On the top bottom you can see the old image of the same image pulled from Google Street View, that sign is not present. A wooden sign at that location reads "Veterans Memorial Park", rather than the name of a school. This website previously documented the widespread creation of school zones solely for the purpose of establishing speed cameras despite state highway administration guidelines specifically stating that this should not be done. 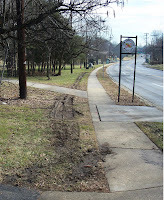 Below are more photos showing the beginning of that school zone at "Mahoney Rd" taken in January 2010 (top), about 0.4 miles before the camera location, along with an image pulled from street view showing the sign was not previously there (bottom). We have obscured the image of bystanders in these photos. We have learned that New Carrollton's contract pays OptoTraffic a 40.5% cut of each paid ticket ($16.20 per ticket) with the city receiving the remaining 59.5%. The terms are similar to contracts which Optotraffic has been signing with other towns in the region. There is a provision of Maryland law which states "If a contractor operates a speed monitoring system on behalf of a local jurisdiction, the contractor’s fee may not be contingent on the number of citations issued or paid" which was intended to ban per-ticket bounties. 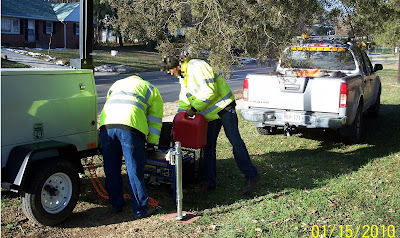 Because per-ticket contracts are more lucrative, New Carrollton's contract attempts to circumvent this restriction by claiming that the city "operates" the devices, whereas OptoTraffic merely own them, transport them, do the initial processing of violations, mail citations, and collects payments. This contract is in many respects the same as the one Montgomery County is currently being sued over. It so happens that our reader/photographer actually caught two Optotraffic employees "operating" the device on film. The individuals confirmed that they were employed by OptoTraffic. Some of what they did included refueling the portable generator that powers the camera and power cycling it -- an act which could have affected any internal settings for the camera. We have chosen not to post the Optotraffic employees faces or identities here out of concern for their safety, but you can see their company owned vehicle in the background which does not display any county, state, or city markings or special registration plates. 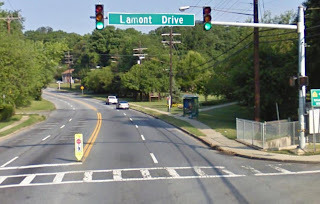 We have also been informed by another reader that New Carrollton has recently held its first District Court "Speed Camera Day". According to that courtroom report several defendants reported on procedural errors by the city. The judge at first did not believe the claims were authentic, finding the first defendant guilty despite them. However after other defendants provided consistent stories and additional documentation the judge was convinced dismissed the several defendants' citations. We'd like to thank our anonymous contributors. Much of the information on website is due to tips and information from readers. Such contributions are critical to our efforts to keep the public informed and to root out government corruption. We encourage those with information to contact us.